Over the weekend buildings across Melbourne threw open their doors for the annual Open House Melbourne event. This year reviewing buildings for the Red+Black Architect blog are an enthusiastic group of final year architecture students. This example of high density living in Melbourne was built many decades ago yet stands to answer some questions many Melbournians are asking of apartments today. Cairo Flats’ character remains vibrant despite its age and shows that combating housing pressures in the face of rapid population increase may be as simple as a shift in expectations. 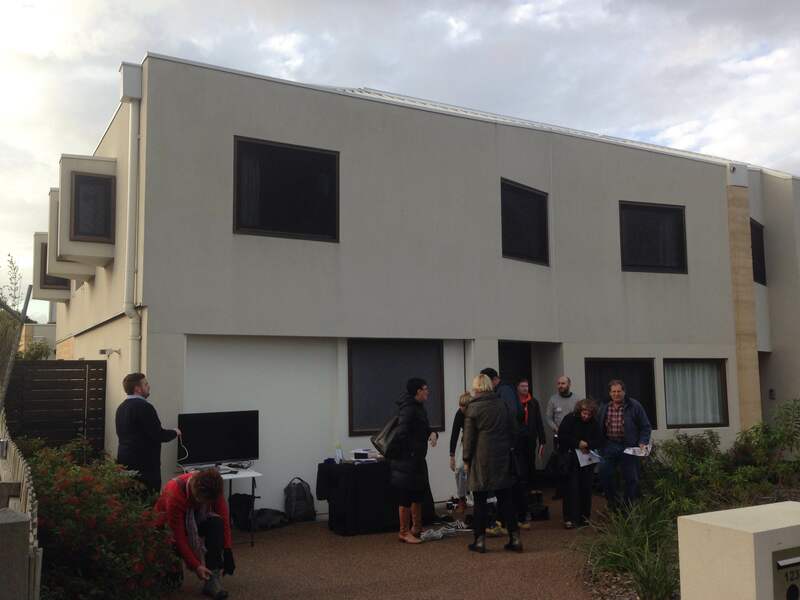 The Better Apartments discussion paper recently released and The Better Living Forum (an event held as part of Open House Melbourne) demonstrate that apartment design in Melbourne is under scrutiny. One of the major questions relates to whether minimum square meter requirements are necessary to increase amenity in new apartments. Cairo flats is a great example of how small apartments can feel like double the size through smart design. Direct access to outdoor space and ample windows make the rooms feel larger. Ceiling heights of 2.9 meters and softly rendered corners give the illusion of space. Furthermore, clever curtain design transforms the studio apartment between uses within seconds. When the curtain is drawn closed along the window, there is privacy from the common courtyard, the bed and wardrobe is exposed and the rooms feels like a bedroom. When the curtain sits in front of the wardrobe the light is allowed in and a living space is revealed. The sense of community was evident during the tour and is probably instigated through exposed central walkways and directly accessible common spaces such as the internal courtyard and the large roof terrace. You wouldn’t realise that you are looking at the world’s tallest Cross Laminated Timber (CLT) apartment building if you passed it. The only suggestion from the street that the construction methodology differs from its neighbours are the timber soffits. This theme continues inside the building, where the apartment appears like any other – floorboards and one feature wall in the living area are the only timber visible. The bathrooms are pods that were prefabricated in Queensland, whilst the structure was prepared in Europe with details such as electrical service channels designed in before shipping. A cross section of the structural system was on display as part of the tour and showed the floor to wall connection – Floor to ceiling looked to be about 450mm including ceiling plasterboard, insulation, another layer of plasterboard, CLT, rubber, screed and floor covering. 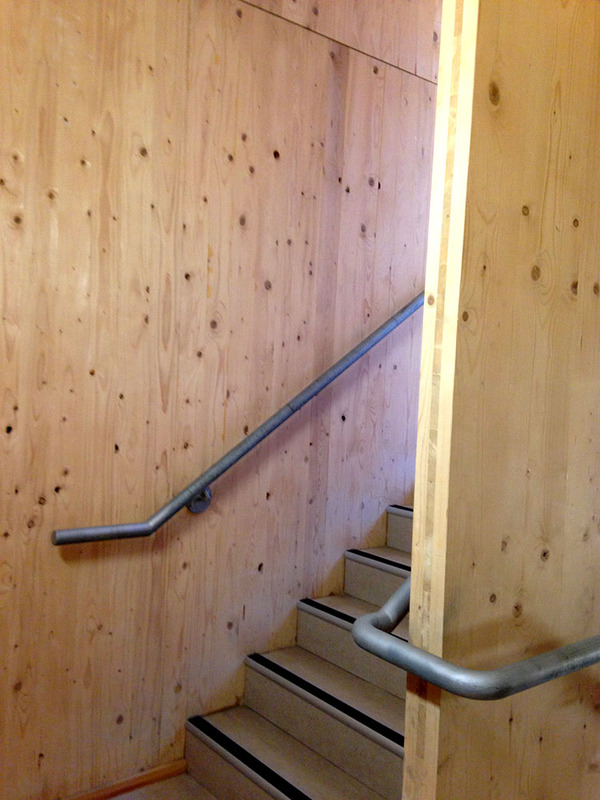 The most interesting part of the tour for me was the emergency stair where the CLT remained exposed; producing the warmest feeling emergency staircase I have ever used. Whilst I suspect that this method of construction would be more viable if CLT were manufactured in Australia, we were told that Lendlease envisions using aspects of this technology in the future. At the Hello House Tour I was glad I chose to park down the street so I had the opportunity to be greeted by the big brickwork HELLO which forms the western street facing facade. The tour began in the original shopfront victorian terrace which is currently being used as a art studio space by the owner and artist Rose Nolan. We were given an wonderful talk by Nolan and the architect Fooi-Ling Khoo, OOF! Architecture about the inspirations for the rear addition. The collaboration between client and architect was long but resulted in a well thought through design that reflected the context of the heritage rich site, that put on show the craftsmanship of not only the architect but the trades involved (in particular the brick layer! ), as well as Nolan’s graphic and font based artworks. While the home uses materials more traditionally thought of as industrial, the structural plywood, concrete and brickwork provided a surprisingly warm finish, although the beautiful curtains and underfloor hydronic heating probably aided this as well. It was a real privilege to get such a personal look at the Hello House, who knows maybe one day I’ll be able to guide a tour through a design of my own. Walking the street, it is not hard to find this house as it does speak out for itself from rest of the houses in the neighborhood. This residence is a fine example of sustainable building using Hempcrete walls and Rammed Earth walls in the design. Our tour guide Dione explained the design ideas conceived by Steffen Welsch Architects, while taking us through the house. On entering the house, you see this beautifully textured honey coloured Hemp wall which helps regulate humidity and acoustics with a small courtyard facing the wall, with a timber staircase going along it. This staircase to me acted no less than a design element of the house. The stairwell acts as wind tower in the house regulating the airflow in the building. Walking further down, you enter into the open kitchen overlooking another courtyard and also acts as the focal point of the house as it has views to all the spaces. Another major feature of the house is the rammed earth walls, which help in increasing the thermal mass of the building and also help in regulating acoustics. Another feature that caught my eye were the skillfully designed bay windows on the upper level rooms which provide privacy and views and also bring in ample daylight into the rooms. Interestingly, the window operating systems were quite amazing. That feature is something all the houses should have! The architects have also included rainwater harvesting system that stores up to 10,000 litres of rainwater. This residence is a great approach to sustainable design and the architects have successfully achieved it and it also gives that warm, cozy feeling in the house. One of the finest architectural buildings of nineteenth century in Australia, standing tall with grandeur in the city of Melbourne, Old Treasury Building portrays the development of this city. This well-proportioned rectangular building signifies its existence by where it sits, looking towards Collins Street. The proportions of this building, both with respect to itself and at an urban scale, were very well thought out by architect J J Clarke, by providing a flight of stairs taking you to the majestic entrance of the building. This gesture has taken the building to a height and given it a setback to enjoy the view from it. What a view from the building to the city! I was awestruck! 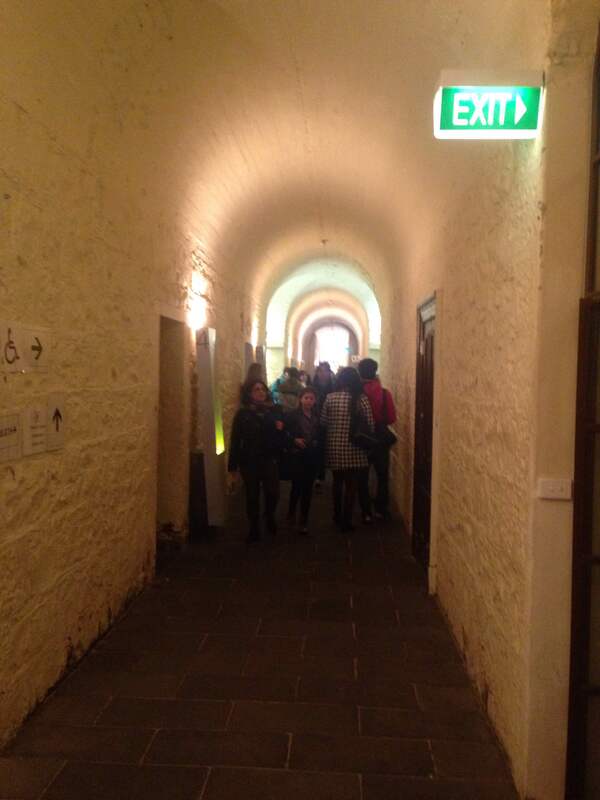 Walking into the building, it is such a well-planned and ordered building spaces that take you through the history of Victoria and its development. The finesse of the every little thing in the building is so perfect, doors and windows framed by polished wood with impeccable design simplicity, sufficing its purpose. The ground floor had the display of Victoria’s history, social and political development and the basement had a display of the Victorian gold rush. The white textured walls in the basement give a very different feeling compared to the upper levels of the building. All the hallways and corridors had a window opening at the end to make the whole space light and breathable. Old Treasury Building is indeed a treasure for Melbourne’s architecture. Bio 21 (by architects Design Inc) at the University of Melbourne was an amazing experience. Coming to Open House as an architecture student my mind was focused on design – design – design and while standing in the impressive atrium in Bio 21 my mind was still focused on the architecture. The large central lift core which forms a cell like shape, the external shading of the building, and the large “pods” that rise up the northern end of the atrium (which as it turns out was the bathrooms – rumour has it, the architects forgot to include them!) But it wasn’t until we started the tour of the level 4 laboratories that I remembered that I was visiting a building where perhaps the most impressive thing was the research that was being produced. One of the labs was researching Malaria, another Parkison’s disease, the next along was creating flexible plastic solar panels and this was all on one floor! Seriously impressive work! I also spent some time in the basement have a look at the NMR spectrometers. What really topped of the tour was our very impressive tour guide Frances Separovic, Head of Chemistry, who made sure he explained how the building functioned and the purpose of the high-tech machines. I now have a reason to visit the docklands. 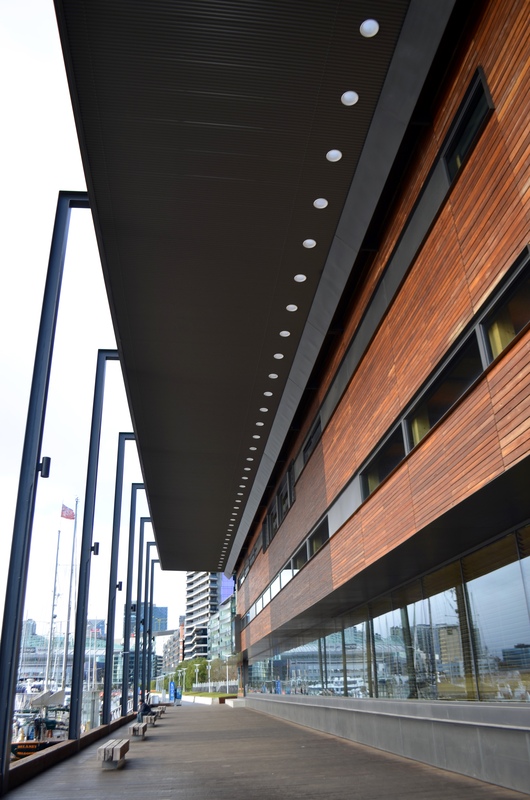 A refreshing departure from its surrounding built environment, the Library at the Dock, designed by Clare Design and Hayball is a three storey building constructed almost entirely of cross laminated timber (CLT). Its humane scale, clever connection with the waterfront’s boardwalk, earthy materials and colour palette make this recycled-timber box an elegant piece of architecture easy to be drawn towards. The interiors are brightly lit with the reading spaces having dramatic views of the harbour. Adjustable wooden louvres lend the much needed shade as well as theatre of light and shadow to the space. The library is packed with a variety of other surprising functions; a children’s indoor and outdoor play area, cafe, performance space, art gallery, maker’s space, music practice rooms, sound recording studio, multimedia hub and a green terrace complete with a table-tennis setup. All intelligently orchestrated and tied together by a central linear staircase. Wait, there is more. It boasts of a passive natural ventilation system, central skylights-thermal chimneys and solar panels amidst other low energy features to have made it secure Australia’s first 6 Star Green Star Public Building Design rating. A soulful building, this community library is exactly what the docklands needed. Dena is a final year Master of Architecture student at the University of Melbourne and a NatHERs Thermal Performance Assessor. Her interests relate to sustainable design and building technologies. Amelia began her studies in Interior Architecture before transferring to study Architecture at the Melbourne School of Design. Amelia’s projects have been exhibited at the Gallery of Australian Design and at the Dulux Gallery, Melbourne School of Design. 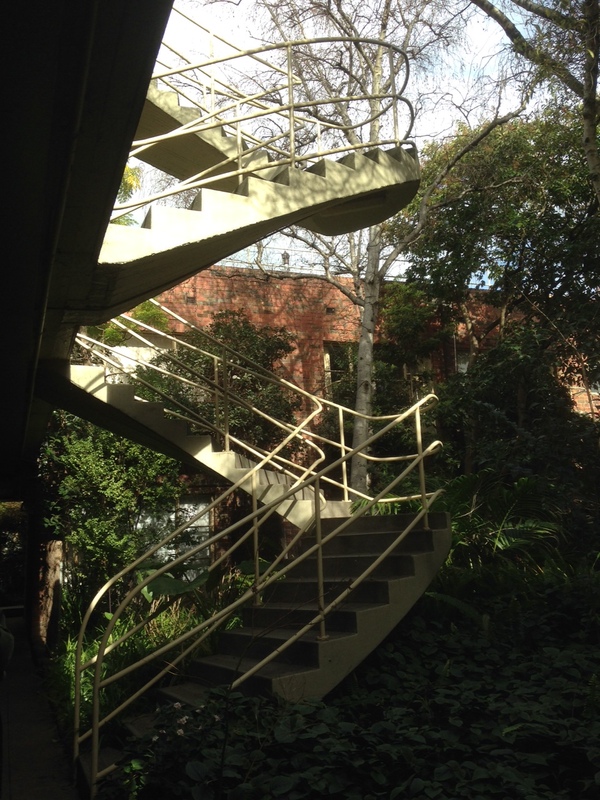 Outside of architecture Amelia interest include art, furniture, fashion, travel, and exploring Melbourne. Megha is a recent graduate architect from Deakin University. She is a keen observer, dreamer and very interested in architecture, arts and design. Farheen is currently undertaking her final semester as a Master of Architecture student at the Melbourne School of Design. She is an avid traveler, who loves to explore new environments. This entry was posted in all posts, Free architecture, Melbourne Open House, News, Review, Uncategorized and tagged Amelia Cloney, Bio 21, Cairo Flats, CLT, Cross Laminated Timber, Dena Barr, Farheen Dossa, Fooi-Ling Khoo, Forte Apartments, Hello House, J J Clarke, Library at the Dock, Megha Joshi, Melbourne Open House, Northcote Hemp Houses, Old Treasury Building, OOF! Architecture, Steffen Welsch Architects. Bookmark the permalink.